It’s time for Kelli’s Show and Tell Friday. Today I want to share a special quilt. This was made by my husband’s grandmother, whom I never had the pleasure of knowing. She was quite the prolific quilter. I imagine that she would have loved my longarm! And, I think she would be thrilled to know that there is now another quilter in the family. I love the the fabrics in the quilt. I don’t think I could pick a favorite block. Thanks for stopping by to see my show & tell item, and thanks to Kelli, for hosting. Randi! That quilt is beautiful and amazing… and just wow! Lucky you!! I’m sure she is smiling down to see one of her quilts loved so much!! That is one of the most beautiful quilts I have ever seen…wow….gorgeous..and it is yours…what a blessing.. This is a lovely quilt. I’ll have to come back and visit again. I’m thinking I will be better as a quilt admirer than a quilt-maker! One of the best I’ve seen, too. I’m just assuming that she hand-quilted this. I don’t think they did any machine quilting then? I’m a little curious about that. I’m a hand-quilter myself. An heirloom makes it that much more cozy! Thanks for sharing this beautiful handiwork. This is a beautiful guilt. Do you use it? Oh my! That is a beautiful quilt! I’ve never seen a quilt like this. It is absolutely beautiful! Lucky you! Well, the posting gremlins are at work today. I love the quilt Randi. You are a lucky lady to have it. I’m sure your grandmother would be so proud. I’ve never seen a quilt like that one before, it is lovely. So gogeous–I can’t believe the time that that must take. So glad you are able to carry on the tradition! This quilt is wonderful! The quilting stitches are amazing. The colors are so very pretty, you have a special keepskake. 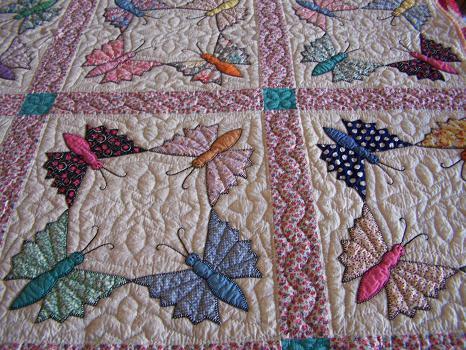 What a beautiful quilt with the butterflies! So nice that there is another quilter in the family now! Thanks for sharing. What a beautiful treasure to have! I love quilts and this one is so pretty, I love all the colors! A great show and tell! Randi, what a beauty! Your quilting and your GIL’s applique make a perfect pair– she would, indeed, be most pleased! It’s absolutely gorgeous! What a wonderful family treasure! What an absolutely beautiful quilt. A real treasure. Thank you, everyone, for all your nice comments on this quilt. I know my husband’s grandmother would be tickled. I want to clarify, she made this quilt in it’s entirety. I did not quilt it. She handquilted this. Wow! That is beautiful! The colors, the quilting………WOW! This is the most beautiful quilt I have ever seen. I love the colours and the design. Very very special. This is one of the prettiest quilts I have ver seen—-you can just see all the love and care that went into this quilt. 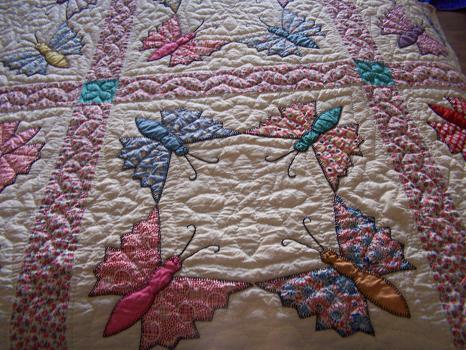 Randi, that is a gorgeous quilt…..it has got to be one of the prettiest old quilts I’ve ever seen. 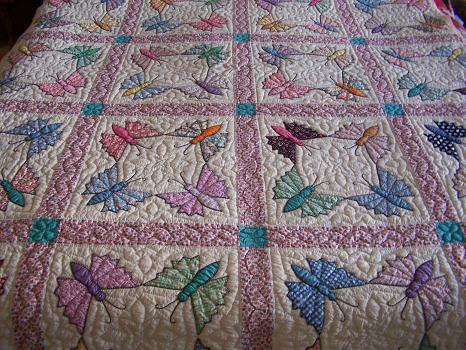 What an absolutely GORGEOUS quilt….and what a treasure! 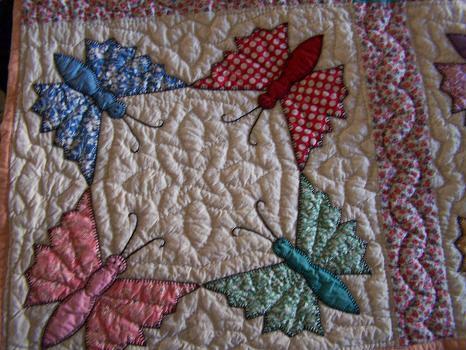 I agree with others who have said this has to be one of the prettiest old quilts they have ever seen. It is gorgeous. When did she make it? It looks to be in perfect condition.